Meridian F80 Stereo Sports The Prancing Pony | OhGizmo! By Andrew Liszewski on 09/10/07 • Leave a comment! A Ferrari in the driveway is just a dream for many people but a Ferrari in the living room is now a far more attainable goal particularly if you don’t mind paying a premium for a portable stereo. 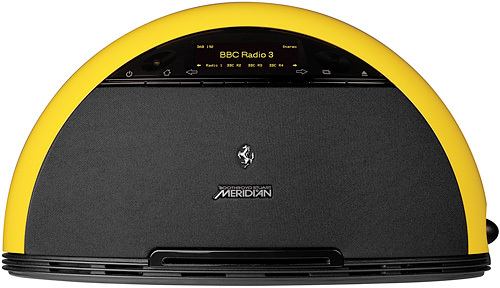 The F80 from Meridian Audio is easily the only ‘boombox’ I’ve ever seen that warrants the prancing pony branding. Besides the slick design the F80 can play CDs, DVDs (it has video out connections) has AM, FM and Digital Radio tuners and can be connected to an iPod giving you access to the music on the device including all of the ID3 tag info (which is displayed on an OLED screen). As for sound performance it uses a powerful 80 watt 2.1 digital speaker system with an integrated sub-woofer but if that’s not enough it can also be connected to your own stereo system. The F80 even comes in the five official Ferrari colors including Rosso Corsa (dark red), Modena Giallo (yellow), Argento Nurburgring (bright silver), Nero (black) and Bianco Avus (off-white). At the moment the Meridian F80 appears to only be available in Europe for about $3,000.